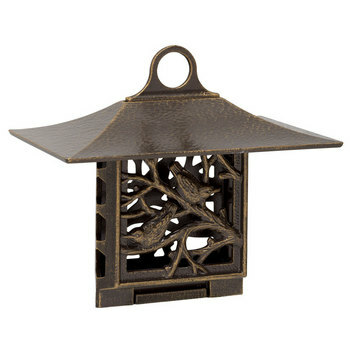 Enjoy feeding and watching birds with this Made In the USA Suet Bird Feeder. The beautiful suet feeder will attract many different types of birds while looking elegant in your garden or on a tree outside the window. 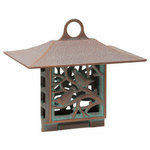 Choose from Copper Verdigris or French Bronze finish. 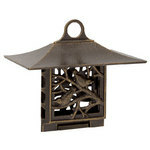 This quality product is made of rust-free recycled aluminum and finished with weather resistant paint. Feeder measures 10" x 9"x 6.75" and weighs 2.9 lb.